Typical of the comments from motoring journalists when the Frankfurt show opened, we hear: “Sure is sleek”, “Great balance”, “Inspirational design”. 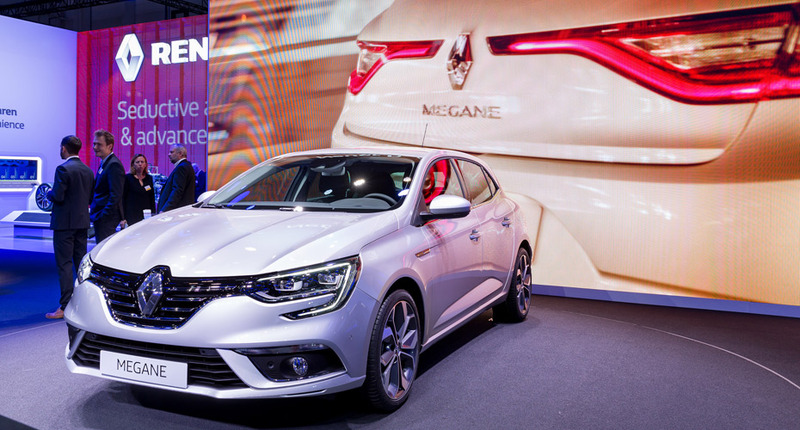 They've got it right: New Mégane boasts an elegantly sleek, aerodynamic design with superbly balanced proportions, a little wider, lower and longer than its predecessor. The Van den Acker design signature is unmistakable, in the distinctive front end with its large vertical badge and wide grille, and in the fine chrome trims at the front and along the sides. As we've seen on Talisman, the distinctive light signature is also part of the Renault design identity. The daylight lamps at the front use LED light-guide technology shining the characteristic C shape. At the rear, the always-on LED units form a transverse signature that makes the car look even wider. In the cockpit-style interior, the comfortably seated driver could easily get the impression of being an airline pilot, not least because of the sophisticated head-up display and the impressive array of advanced technologies at his or her disposal. 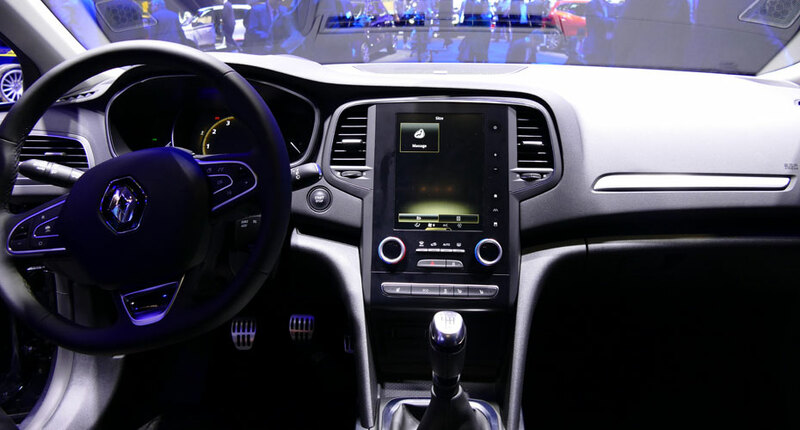 That's in addition to the 7” TFT dashboard dial, the central control console, and the vertical screen of the 8.7” RLINK2 touchpad at fingertip distance. Comfort and harmony reign in an interior that has very evidently been designed with visual and tactile quality uppermost in mind. For example, there's the neat finishing touch of fine chrome trims for the dial, steering wheel , air vents, console, buttons, etc. 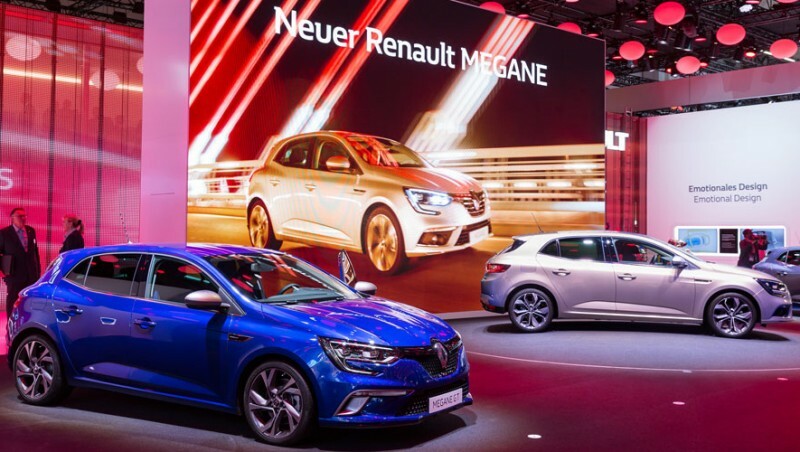 Driver and passengers on board New Mégane also enjoy superb audio quality, from the Audio Bose system with its digital amplifier, bass box and nine loudspeakers located evenly throughout the passenger compartment. 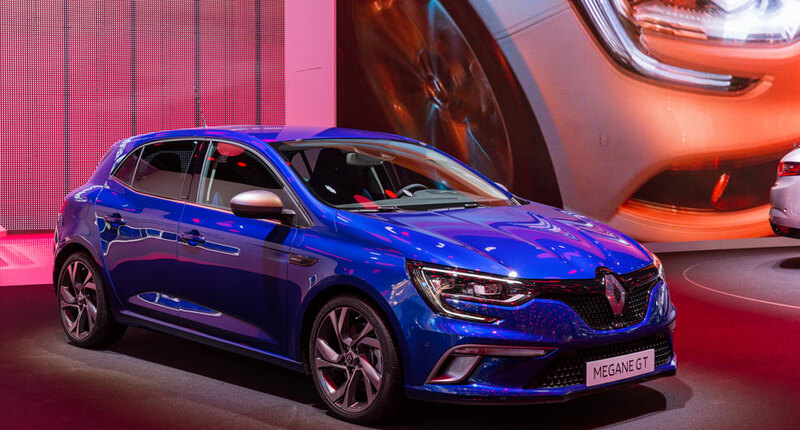 As on New Espace and Talisman, New Mégane brings in many features more usually reserved for much more expensive cars, such as the colour head-up display, the colour TFT dial, the two RLINK2 tablet formats, and the highly sophisticated Multi-Sense and 4Control systems. 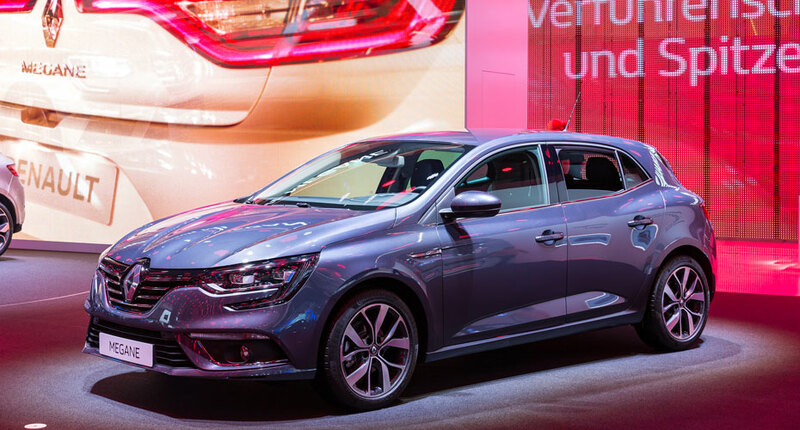 Among its many virtues, New Mégane will be silencing any of the criticisms that might have been levelled against Renault for underpowering its cars. New Mégane offers a very wide range of engines, and perhaps the most exciting news on this front concerns the HybridAssist electric-diesel power unit that will be coming in early 2017. With HybridAssist, New Mégane will leap to front place on the market with CO2 emissions down to just 76 g/km, for NEDC-cycle fuel consumption under 3 litres per 100 km. New Mégane GT sports an exclusive new colour, Iron Blue. Outside, the front bumper is designed to express the car's decidedly sportslike inclination, true to the Renault Sport heritage. The upper and lower radiator grilles are specific to this version, as is the wide lower air intake with scooped surround. Then features such as the Dark Metal finish on the wing mirrors further highlight membership of the exclusive GT clan. On option, there are 18” GT-badged diamond wheels developed specially by Renault Sport. The twin chrome tailpipes at the rear of New Mégane GT echo the front scoops to lend a further touch of stylistic coherence. Between the tailpipes there's a diffuser, hinting at the Renault Sport Formula One connection. And the Renault Sport badge appears at the rear to the left and on the front wing. Inside, the car exudes the Renault Sport spirit. The smart wrap-around seats with integral headrests, blue stitching and chequered sport logo bring comfort and lateral support. There's a choice of three upholstery materials: textile, Alcantara® with blue strips, and Alcantara® with black strips. The ergonomically optimized steering wheel, sports-style aluminium pedal unit and special gearshift, plus paddles under the steering wheel, are all designed with sports motoring in mind. The dial and screen graphics are specific, and include a competition-inspired Race mode. The blue trim features echo the Iron Blue body colour to express the very special New Mégane GT identity.